Summer is often a lot of fun with barbecues, camping, hiking, swimming, and so much more. When we have fun outdoors, we often take our pets with us. They can be more prone to pest problems in the summer since more bugs are out then.What can you do to help them? 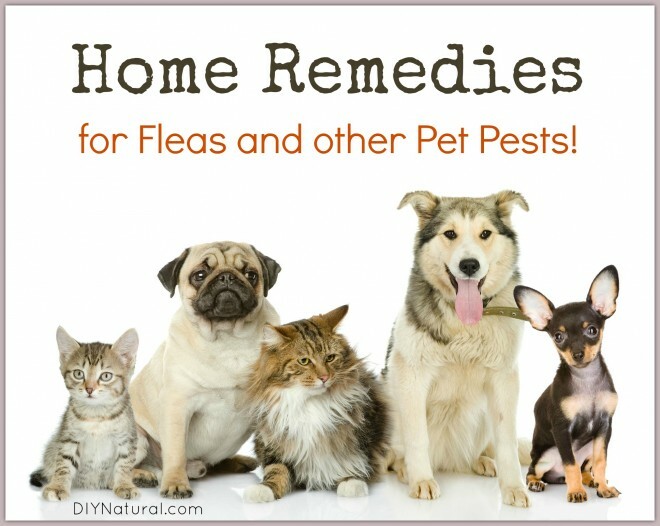 There are many home remedies for fleas (and other pet pests) that you can begin using. Some of these affect dogs more than any other pet, while some of them can affect all pets or certain other pets. So what can you do to treat these problems? Let’s take a look at each one individually. Fleas are often much worse in the summer just because they love the heat. In fact, fleas can go dormant in the winter, only to reappear in the summer. Pyrethrins work well for a spray. It is made from chrysanthemum plants and is very safe (as long as it is not combined with synthetic ingredients like piperonyl butoxide). Use it on your pets and on the floor and bedding. Have a severe flea problem? Sprinkle salt in the carpet, leave for a few days, then vacuum up. Then go over the same area with DE. Allow it to be walked on for a few days and vacuum up the excess. The crystals will last about six months before they break down and the treatment needs to be repeated. There are various types of worms that can affect your pets. One of the most common is tape worm. This can be effectively treated with crushed eggshell added to the pet’s food. When I see a problem starting, I add a tablespoon of crushed eggshell to a bit of soft food. Most pets will eat it right down and not refuse it. Yogurt can also be an effective treatment for worms. There is evidence that a boost in natural bacteria in the gut can help fend off worms. A tablespoon of garlic oil – It’s a strong antiparasitic that won’t harm your pets. Raw pumpkin seeds – Grind them up and add about a teaspoon of the powder per 10 pounds of a dogs weight. It is great in helping to expel worms. Diatomaceous Earth (DE) – It can be added right to the pet’s food with no worries of overdosing. Mix up to a tablespoon a day into their food. Don’t leave it as a powder since it can irritate the lungs if inhaled. Pineapple weed – Much like chamomile in looks and scent, this will work just as well. Ear mites love the heat of summer and also thrive in humidity. A small amount of peroxide can be used to treat ear mites. This treatment is best done outdoors. Using an applicator bottle (like this), squirt a small amount of peroxide into the ear canal and let it foam a bit. Your pet will want to shake it out since the bubbling and popping noise will probably bother them. I let my dog run all over the yard and shake as much as he wants. When he slows down, I hold onto his collar and do it again. This has to be repeated a few times to remove all the mites. Be careful not to get more than just a few drops in the outer part of the ear. You can drop a few drops into the ear but don’t insert the applicator tip into the ear canal. After it’s all cleaned out, make a paste with corn starch, garlic oil, and probiotic powder. (Amounts don’t need to be specific.) Mix it up and apply it to the outside of the ear canal. Maggots are disgusting albeit necessary at the same time. Flies will lay eggs on feces left on the tail or matted fur that has bodily fluid in it. The truth is that a small injury to the skin, even a pinhole size, can attract flies. They then lay eggs which hatch within 12-24 hours. The maggots hatch and feed on dead tissue. They are used for this in alternative medicine to eat around injuries in humans. In pets, a severe infestation can weaken the pet and result in death. To treat, you’ll first need to shave your pet. It doesn’t matter if it looks bad, you need to know if there is one spot or if there are more. Once shaving is done, wash the pet in a flea and tick shampoo. This will not kill the maggots (not much will) but it will destroy any eggs. If you find live maggots, use gloves to pull them off by hand and drop in a bucket of hot soapy water. Dry your pet and treat any injuries with an antibiotic salve. To discourage more flies, keep the pet clean and spray with an insect repellent spray. I did not include heartworm because a test is needed to determine if the pet actually has heartworm or if there is something else going on. It must be treated by a vet as there are very few natural remedies that work completely. Garlic oil can help as can sorrel. It is a strong antiparasitic that won’t harm your pet. Have you had problems with pests this summer? If so, how are you treating them? Share below! Thank you everyone for the comments! I will be trying this out! I’ve been struggling with ear mites for almost a year and it doesn’t matter how often I use peroxide I can’t get rid of them in my cat’s ears. You suggest also using a paste with corn starch, garlic oil, and probiotic powder. Can you explain what this second step does. PLEASE make sure if your using DE that it is FOOD grade & NOT POOL grade!! I also heard/read on several websites (over many years) that getting DE wet renders it worthless??? Wondering how the DE works when it’s mixed in a liquid. I was under the impression that because DE’s have sharp edges that is what cuts into the fleas exoskeleton, so when it’s wet they become soft? Thank you for the article. De comes from a coral like substance, so it will remain hard even when wet. It is often used in filters, like pool filters, to hold back anything larger than itself. So whether it’s oil or water, it won’t get soft, but will remain hard. The sharp edges will wear out after a time, so it will need to be replaced after 6 months of so. I wanted to know the 3 worst foods for thyroid. I just wanted a list not spend time on a video. Hi, Tnx for all the informative articles. DE is an amazing product. I found it very helpful that you mix it with some olive oil. What a brilliant idea!! Obviously I used it dry, not knowing about the oil, and it dried my poor little dog (Dachshund) skin something too terrible. So I have been using Neem oil mixed with Olive oil and it works like a bomb. His coat is beautiful and shiny. Also what has helped him is I no longer feed my little man kibbles, he gets home cooked food just for him with the correct combinations. May I ask a question pls? I give him 1/4 tsp DE every evening in his wet food, is this too much or too little at a time to be effective?? Sure would appreciate some help. I think 1/4 teaspoon once a day is fine, Lorraine. If he seems to be doing ok with it, then I would keep it up. DE works great internally on tapeworms and other worms. I mix a cup or so into my chicken and goat feed. Not only does it help with internal parasites, it also helps to control Indian meal moths, a bane of the pet owner. They can get into a bag of food and destroy the whole thing, not to mention flour and other baking products in your pantry. I am hoping to find what I can do naturally about ticks. I don’t want to use chemicals in the yard or on my pets, but we are being overrun. You can make a spray to help deter ticks. It will sometimes work to kill them too. Take a small spray bottle and fill it halfway with distilled water. Then add about a tablespoon of alcohol. I use vodka because it is less harsh. Then you can add a few drops of essential oil. I use citronella, lemongrass and geranium. Shake it well and spray on your dog. This can be used on cats too, although spraying can be difficult. I spray the solution on a large towel and then wrap it around the cat and hold him for a few minutes, enough time for the oils to transfer. I want to try the flea remedy. How often do you have to rub the DE and Olive Oil solution onto your pet’s skin to be effective? I have a 50 pound dog and no matter what we use, the fleas just eat him up. I tried an organic/natural remedy and still did not work 100%. Please help! You should also treat the whole yard with the DE. that will take care of any in that area as well. i leave a sprinkling of salt under all my area rugs and between the cushions of chairs and sofa. that gets vacuumed once a month then reapplied. Thanks for getting to it before I did Janet. I should add too, that the DE crystals do break down over time, but not quickly. You may need to retreat monthly if the dog is scratching a lot, but less if it is left alone.